Join the Skylanders as they team up with the world’s most formidable marsupial, Crash Bandicoot, and his former arch-nemesis, Dr Neo Cortex, to take on Kaos’ evil clone. Harness the power of imagination to create your very own Skylands hero, known as an Imaginator. Train them with the series’ greatest warriors, unlocking powerful new moves and abilities as you battle to protect The Skylands. Featuring 31 Skylanders from across 10 powerful battle classes, these iconic heroes are on hand to mentor your Imagintors, unlocking brand-new weapons, special new game areas and secret techniques. They also wield the almighty Sky-Chi super moves that can be taught to your own heroes. 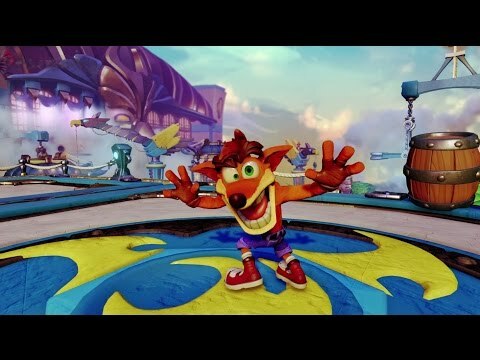 Also, play as the legendary Crash Bandicoot, employing the signature map-cap abilities from his Wumpa Islands adventures to crush the threat of Kaos.